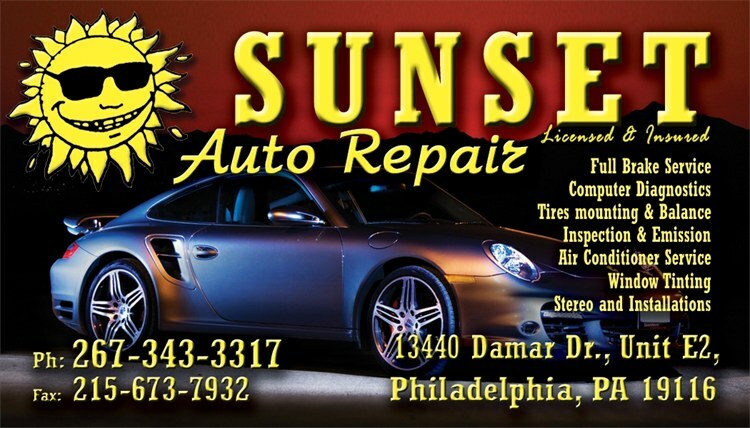 Welcome to Sunset Auto Repair Center serving the Philadelphia metro PA area. Providing car, truck, SUV, hybrid and fleet repair with quality service and maintenance. Whether it is time for an oil change, tune up or you need an accurate auto diagnostic testing and repair, you can count Sunset Auto Repair for Honest dependable service. We work on...virtually every make and model of vehicle. We stay current by sending each technician to approx. 50 hours of training each year. We offer over 15 years of experience in Philadelphia area with a reputation for quality service at an affordable price. We emphasize on personal attention and treat all of our clients like our own family. If you have an import, european or domestic, we know how to fix it. We are a full service independent repair shop for all cars and we use high quality parts. We love what we do and we will get you back on the road in no time! Sunset Auto Repair was founded with one specific mission: to provide superior service for all your car needs in the Philadelphia metro area. At a time of changing values, and in a dynamic industry, we employ leading edge technology and expertise within a framework of traditional business ethics and personal service. 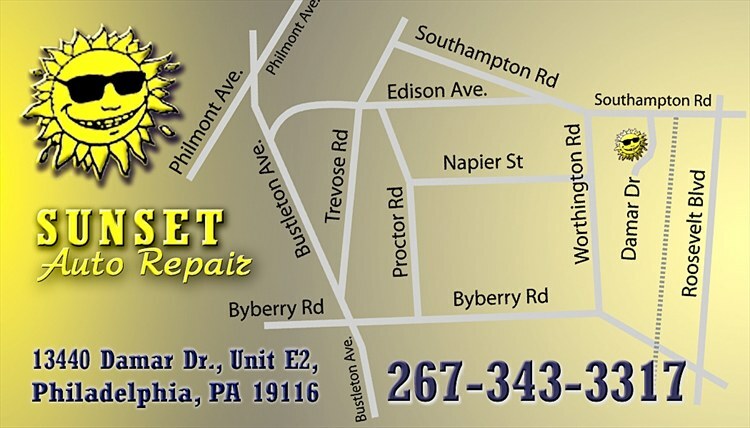 Make your next Brake Repair, Brake Pad and Shoes replacement, Oil Change, A/C Service, Timing belt Replacement, PA Inspection, PA Emission, State Inspection, Tire balancing, Tire Mounting, Wheels rotation, and all your auto repair and scheduled maintenance needs at Sunset Auto Repair in North East Philadelphia (19116).